We finally did it; we got ourselves a trainer! I'm so excited for us all. I get letters from readers about twice a week, asking questions about training. While I've had a degree of experiences, I'm not a qualified trainer, so I take on only those questions where I feel I can honestly be helpful. Now things will be different. I'll be publishing your questions with the answers of a certified dog obedience instructor. I am thrilled to introduce her to you today. 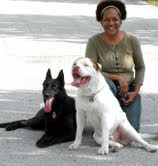 Her name is Judith Joseph; she and her 6 dogs live and work in Kissimmee, where she owns Total Control Dog Owner Assistance (TCDOA). So, you may ask, "What is so special about Judy? There are dozens, if not hundreds of dog trainers out there." I love her philosophy: TCDOA training takes your lifestyle seriously and develops a training strategy especially for you and your dog. No cookie cutter training that you cannot implement in your own home. Describe your dog: size, breed/mix, age, activities, exercise routine (frequency, time and activity), issues, where he spends his "down" time, activity level, other dogs in your home, socialization, and how much time he spends alone each day. Give Judy a bit of background on your dog's previous training and your philosophies about your dog and how you would like your relationship with him to be. Does he sleep in a crate? Or in your bed? Is he your dog or your child? What level of perfection are you seeking? Now ask your question and restate it in a goal. This will help Judy target her answer, as much as possible, to you, while still offering helpful information to other readers. If you would like them included in your answer, send photos of your dog along with his name. No humans, please. Include the words ASK THE TRAINER in the subject line, when you email your question to us at LetsAdoptaDogPark@gmail.com. Okay...get going...dig up those buried questions and fire them off to us. All Things Dog Blog's ASK THE TRAINER is waiting to hear from you. All Things Dog Blog is proud to announce its latest award: I-Love-Dogs.com's Webmaster Award. Welcome Judy! We're looking forward to your next post this week.